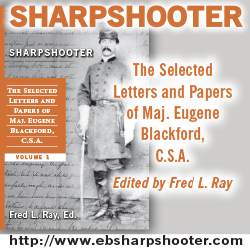 Maj. Francis E. Pierce participated in the suicidal attack on Marye’s Heights at Fredericksburg 100 years ago and lived to write a vivid account of his experience in a letter to a friend. Hitherto unpublished, here is that account. A member of the Richmond Howitzers, this talented artist left a collection of superb paitnings and sketches showing the life and times of the Confederate soldier. Two of the shrewdest generals in the Civil War commanded the armies in this classic campaign whose outcome sealeed the fate of the Confederacy. This one-time slave became both a symbol and an effective spokesman for the Abolitionist cause. Southerners had other names for this cannon and the Federals who set it up to fire on the City of Charleston. U. S. Grant knew how to seize this Confederate fortress town which denied the Federals use of the Mississippi; that was to put an army across the river downstream and attack from the land side. But first he had to get the necessary boats past the mighty guns of Vicksburg.